The Big Plant in the Twin Cities! Canterbury Park is a one mile thoroughbred track, with a seven furlong inner turf course, located in Shakopee, which is located about twenty five miles southwest of Minneapolis. Built in the grand style of the forties and fifties, it is a glass enclosed climate controlled facility that houses a card club which is open twenty four, seven. 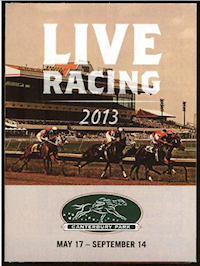 Live racing is conducted from late May to September, simulcasting is available year round. The grandstand and clubhouse are on the same footprint with the clubhouse occupying the third floor including a restaurant. The grandstand has a capacity for 16,000 patrons, there is parking for 10,000 cars and the stables can hold 1,600 horses. Canterbury Downs opened on a grand scale in June of 1985. During construction it was discovered to have it's own glacial water fall under the grandstand. When the official sign was posted after the first pari mutual in Minnesota, hunch players were quickly rewarded. The race winner Faiz an English bred was reportedly sired by a horse named Canterbury Road, although that may be a Canterbury Tale. Anyways things were off and running. After an encouraging inaugural meet big plans were made for year two. In year two the track announced the running of the St. Paul Derby, a Grade III stakes with a purse of $300,000. The race was eventually renamed The Minnesota Derby, with the purse growing to $400,000 and Grade II status. This seemed like a good sign for the track, but 1986 might have been it's high point. In 1990, the original owners were feeling the pain of their grand plan and unloaded the track to Ladbroke racing of London. Just two years after taking over, Ladbrokes announced it could not fund the now downgraded Minnesota Derby, causing some problems with the Minnesota Lottery which had agreed to put up most of the purse as part of a promotion. Adding insult to injury, Ladbrokes announced they were shuttering the plant and retreating back to Jolly Ole England after the 92 meet. The sprawling plant in Shakopee seemed doomed. As luck would have it a group of local business men purchased the track in 1993 vowing to return live racing to the Twin Cities. In 1994 they re-opened now renamed Canterbury Park for simulcasting. True to their word live racing returned in 1995 and has continued to this day. The St. Paul Derby is history but has been replaced with the Claiming Crown, a Breeders Cup for claiming horses, that has proven to be popular with horseman and fans alike. In 2000 Canterbury got a boost when it was able to open a card room, but has not been able to secure full casino gaming. Canterbury Park returned in 2011 for another season of live racing from May to September. It remains open year round for simulcasting and poker. Dean Butler took top riding honors. In November of 2008, I had to use up some gambling rewards, after they told me I couldn't get Patriots tickets for Indianapolis, my son and I decided on a Sunday night game in Minneapolis. So form New England we drove to Minnesota via Mt. Rushmore. From Minneapolis on Sunday morning we started with a thirty minute trip north to Running Aces, from there we drove thirty minutes south of Minneapolis to Canterbury Park. Canterbury Park was quite an imposing sight, after seeing new tracks like Running Aces and Plainridge, this place looked like overkill. There were a lot of cars in the parking lot, as were there people crowding the card tables inside. They really like their cards in Minnesota. After a quick look there was nothing much to do, but things worked out when I saw that the guys at valet parking were also selling souvenirs, I was able to get my Canterbury hat. Anyway it was time to get back to town to find a sports bar to watch our Patriots get crushed by Big Ben and the Steelers, to the delight of the people of Minneapolis, what did we ever do to them? Moral of the story everybody outside of New England hated the Patriots way back in 08.